It's a debate that has existed for decades. The database architects insist that data is golden and the most efficient way to build software is to generate it from the database schema, while the object-oriented code junkies swear that a nice "domain model" is the way to go and that persistence is a side effect of making those objects stick around longer. Of course, if you've worked on enterprise projects long enough you'll find the answer is often somewhere in the middle: some projects benefit from a database-centric approach, others from a model-centric approach, but many require a outward in approach. Design the schemas for the database to do what it does best with relationships, design the domain model to encapsulate the data and behavior of the class, and translate one to the other (hence the ORM, or object-relational mapper). For a very light example, consider a conference event that has speakers and sessions. Speakers may "own" several sessions they speak at, while sessions may "have" several speakers when the session is co-hosted. It's important to note that these models don't just contain data. They also contain some business logic or behavior because the methods are exposed to add children and handle the reverse navigation (i.e. if I add a speaker to a session, the session should also get added to the speaker). The models were created in a Silverlight 3 class project. This allows the project to be shared directly in the core framework as well. Without using linked files or other exotic means, we have an assembly that is truly shared between the Silverlight client and the .NET desktop or server framework. 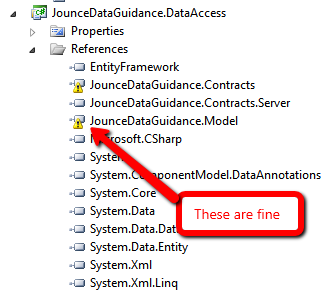 Note also that "JounceDataGuidance" is a strong term ... this isn't meant to be total "guidance" but more an experiment and reference for one way to glue data between the client and the server. Next, we'll define a simple data access layer. This will be an abstraction to the underlying mechanism which in this case happens to be Entity Framework 4.1. Some people may argue these abstractions aren't necessary because people seldom actually switch their data provider. I disagree for two reasons. I've been on projects where switching the data provider has happened (or we've eventually had to aggregate data from multiple sources). Unit testing of a business class should never require access and setup to a database implementation. You should be able to mock the data access contract instead. There are two contracts. The first is for a unit of work. This is a pattern that similar to the concept of a transaction. It allows you to manipulate your objects in a discrete "unit of work" and then either cancel that unit of work or commit it all at once. This prevents sending a bunch of smaller, atomic operations to the database and allows the data access layer to coordinate the changes all at once. Commit will complete changes. Complete will close the connections but will not commit. It's not a "rollback" because we won't have actually interacted with the database, but it says, "complete this operation and flush any database goo without sending my changes over the wire." The project will work perfectly fine and compile without issue. Notice all of this was done without any generated model. The next step is to implement the basic data access layer. The base class performs the common operations, and allows the derived classes to supply what the target collection is. There are two offered: a set (shallow) and a query (deep) for including children in the object graph or not. Speakers looks very similar so no need to post it. Notice that while this layer implements the Entity Framework and the code-first feature, the contracts for the unit of work and data access contracts are sufficiently generic enough to allow for any type of implementation. You could easily use a generate model, plug in nHibernate or use ADO and still be able to honor the contracts. Notice that at this level, the objects are being interacted with directly. 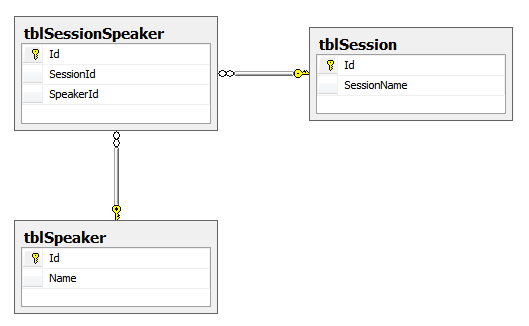 To add a session for a speaker, the data access layer is queried to get the latest classes, but then the behavior on the class itself is used to add a speaker to a session. Again, note the sessions are flattened to avoid recursion. 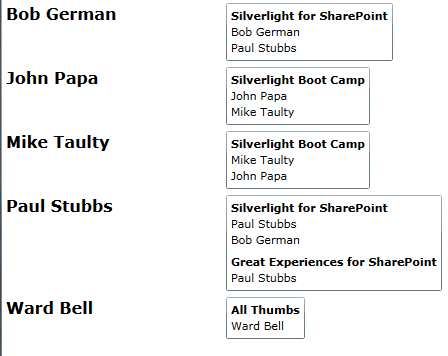 Silverlight can now access the exact same model project and business contract we used on the server side. There is no need to map to intermediary objects, juggle and jump through hoops. Yes, you can even share behavior without using WCF RIA! First, we'll make a few helper classes to handle the REST calls. 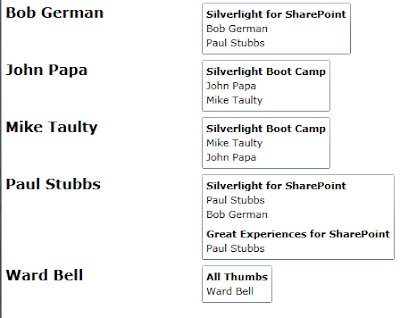 REST is fairly easy with Silverlight and doesn't require adding service references. Instead, we can use the WebClient. Notice this helper handles two patterns (I know, I'm not completely separating my concerns ... but isn't the project getting big enough already?) The first is a POST where the payload is serialized in the post and a key is retrieved. The second is a GET that returns a list. Notice how easy it is to just pass through to the helper for the various functions becaus they are mapped faithfully to the service layer! Now there is some hackery going on in the final list, but it is there to illustrate an important point. The speakers are returned without sessions, so an inner loop requests the sessions for each speaker. When the sessions are returned, the method on the class is used to add them so we are using the exact same behavior for the model regardless of whether we are on the server or the client - it is truly shared between both. In this case it will make sure the session is added to the speaker and then the speaker is added back to the session. A count is kept to make sure we get sessions for all speakers before the list is returned to the caller. What about the data generation? I didn't have time to build a full CRUD example but I wanted to show inserts and updates from the client, so I decided to generate the data from the client. The first time you run the application, it will request the list of speakers and receive and empty list. It will then generate the speakers and sessions, ask the server to update them and then request the speakers list a second time. This time it will faithfully show a list of speakers and sessions (with a sub-list of speakers to show the navigation properties). Because our data generation needs to happen sequentially, I'll take advantage of the IWorkflow interface in Jounce. I created two implementations, one to add a speaker and one to add a session. Here is what the session action looks like. It uses the business contract to add a session and then calls invoked, and the Jounce controller ensures it completes (without blocking the UI thread) before the next step is run. It should be very clear and natural what we are doing. Create a speaker. Create a session. Now add the session to the speaker ... and because the service layer shares the models, the behavior of the recursive links between sessions and speakers is preserved. As you can see, very straightforward (and readable) statements, including the correct inserts for our linked table based on the mapping we declared in the configuration. <Grid x:Name="LayoutRoot" Background="White" HorizontalAlignment="Stretch" VerticalAlignment="Stretch"
Grab the full project with database schema and tests here.